Come & Relax at 604 Summerlin on the beautiful white beaches directly on the Gulf of Mexico. Enjoy the perfect sunsets and watch the boats & dolphins from your large balcony. 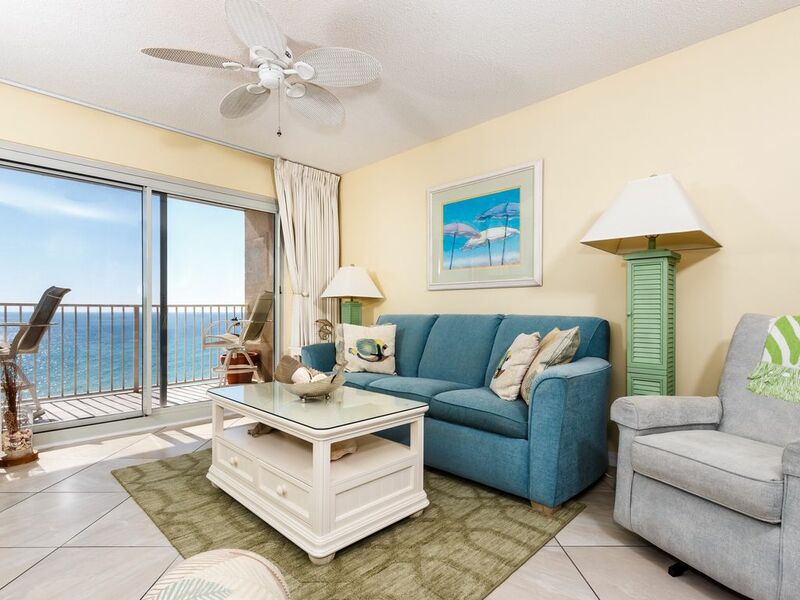 The Summerlin is an intimate, quiet, and beautifully-appointed, 30-unit condominium that has been voted most attractive building on Okaloosa Island. The Summerlin is situated on 200 feet of snow-white beach in the middle of Okaloosa Island (Fort Walton Beach), a narrow barrier island that affords both Gulf and intercoastal waterway views. This beautifully decorated, two-bedroom, two-bath unit sleeps six.The master bedroom has a king size bed with a newly renovated bathroom. The sliding doors take you directly to the balcony. The extra large balcony overlooks the sugar-white sand and shimmering emerald and turquoise waters of the Gulf. The master bedroom has a HD/LG TV mounted on the wall with a blueray DVD. The fully equipped kitchen has upgraded appliances with granite counter tops.The large utilityroom has full size washer and dryer. The dining area has table and chairs for a seating of 6. The newly decorated livingroom has a new sofa bed, a new recline chair, new swivel chair, HD/LG TV, blueray DVD, with a compact disk player and ipod docking station. There are over 50 DVD's for your enjoyment. Walk out livingroom to the large balcony with a high table and 4 captains chairs,with a chaise lounge, to get a great view of the dolphins. This condominium has great 'curb appeal' with lush tropical landscaping. Okaloosa Island is the Gulf-front beach community of Fort Walton Beach. Located between Fort Walton Beach and Destin. Come take a stroll on our beaches, play in the surf, fish from our pier, or stroll our boardwalk with nightly entertainment, restaurants, hotels, and shops. Okaloosa Island is a three-mile strip of beach sandwiched between federally-protected land (beaches) that will never be developed. Okaloosa Island is only six miles from Destin, but without the crowds and traffic of Destin, largely due to its limited size and a height limitation (seven stories - no high rises here). toilet, shower, NEWLY RENOVATED BATHROOM WITH WALK IN SHOWER AND NEW VANITY. Non-smoking rental includes FREE BEACH SERVICE,, Infant/Child Pack-n-Play, beach toys Games, Videos. Additional linens/towels provided. Immaculate, well appointed, spectacular views, that’s 604 Summerlin! Our hosts, Dale and Bob, we’re always available for questions. We’ll be back next March. This is the second time we’ve stayed in this condo and we’ve already booked for the same week next year. The condo has tons of amenities, extremely clean and very comfortable. Beautiful, completely updated and has a great balcony with a gorgeous ocean view! I can’t imagine staying anywhere else. This was our 5th time staying at the Summerlin and by far the best condo we have rented in that building. We were very impressed with the cleanliness. Dale was just a phone call away and totally available had we needed anything. The master bed was super comfy, as well as the all the other furniture. The kitchen was well stocked and there was plenty of lamps throughout. The pictures don’t do it justice when it comes to details. We stay in this building for the layout and size. There is not another condo in the panhandle that has such an entertaining kitchen layout. Bedrooms are a good distance from one another. Not all buildings this size have a bathroom at the pool...... very handy! They keep the grounds immaculate! Bob and Dale were wonderful to work with. The condo is so comfortable and fully stocked. Can’t say enough good things.